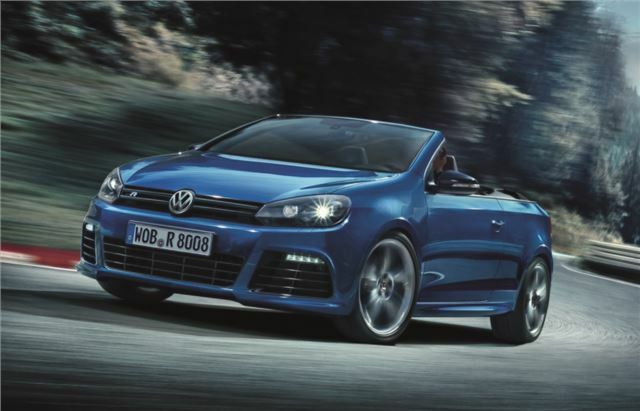 Volkswagen has revealed the Golf R Cabriolet which goes on sale in the spring priced at an eye watering £38,770. While the new Golf hatch is now on sale, the Cabriolet version continues as before, having only been launched in 2011. It's the first time Volkswagen has designed a drop top version of the high performance R version and it's certainly not cheap. It's powered by the same 2.0 TSI engine as the standard Golf R with 265PS but unlike the hatch which is four-wheel drive, the Golf R Cabriolet is front-wheel drive only. It does get a six-speed DSG automatic gearbox as standard which helps give it a 0-62mph time of just 6.4 seconds. The R Cabriolet gets a bespoke front bumper with a gloss black grille plus xenon headlights, black brake calipers and a gloss black rear diffuser. There are also chrome exhaust pipes and smoked LED rear lights. The R rides lower than a standard Golf Cabriolet with 25mm lowered sports suspension while 18-inch alloys are standard. 19-inch high gloss black wheels are an option. Inside it gets leather sports seats with contrasting grey stitching that also features on the steering wheel and gear lever plus there are brushed aluminium pedals. Meanwhile Volkswagen has also launched the Beetle GSR, pictured below. A high performance version of the Beetle it gets the turbocharged 2.0 TSI engine from the Golf GTI with 210PS. Just 3500 will be sold worldwide and only 100 are expected to arrive in the UK with orders being taken from May. The yellow and black colour scheme is based in the Beetle 1303 S from the early 1970s with a black bonnet, roof and boot plus black body stripes with GSR lettering on the bottom of the doors. There are also yellow bumpers in a new R-Line design and a yellow and black rear spoiler. If it's a little too garish for you, the GSR can also be ordered in Platinum Grey and Black. Other special features include 19-inch Tornado alloys painted black and sports seats inside. The GSR will acclerate from 0-62mph in 7.3 seconds helped by 280Nm of torque available low down the rev range. Claimed economy is 38.7mpg.